This article is about the county in Connecticut. For the town in Connecticut, see Fairfield, Connecticut. Connecticut's location in the U.S.
Fairfield County is the southwestern-most and most densely populated county of the U.S. state of Connecticut. A bedroom suburb of New York City, the county has a population of 916,829 according to the 2010 Census, giving a density of 1,465 people per square mile. It is located within the New York-Newark-Bridgeport, NY-NJ-CT-PA Combined Statistical Area and contains four of the State's largest cities (Bridgeport (1st), Stamford (4th), Norwalk (6th) and Danbury (7th)) whose combined population of 433,368 is almost half the county's. Fairfield County's Gold Coast helps rank it sixth in the US in per-capita personal income by the Bureau of Economic Analysis in 2005, contributing substantially to Connecticut being one of the most affluent states in the US. In addition to its wealthy communities, Fairfield County is also home to lower-middle and working class-cities such as Bridgeport, and Norwalk. Other communities are more densely populated and economically diverse than the affluent areas for which the county is better known. As is the case with all eight of Connecticut's counties, there is no county government and no county seat. As an area it is only a geographical point of reference. In Connecticut the cities and towns are responsible for all local governmental activities including fire and rescue, schools, and snow removal; in a few cases, neighboring towns will share certain resources. The Fairfield County Jail in Bridgeport on the corner of North Avenue and Madison Avenue, still actively used to house prisoners. The Fairfield County Court Houses in Bridgeport and Danbury which served the county's judicial needs and housed county deputy sheriff's until December 2000. The court houses are still marked "Fairfield County Court House". Law enforcement within the geographic area of the county is provided by the respective town police departments, whereas in other states in the region such as New York and Vermont law enforcement would be provided by the local county sheriff's department. In the less dense areas, such as Sherman, law enforcement is primarily provided by the Connecticut State Police. Prior to 2000, a County Sheriff's Department existed for the purpose of executing judicial warrants, prisoner transport, court security, Bailiff, and county and state executions. These responsibilities have now been taken over by the Connecticut State Marshal System. Some municipalities in the county still maintain a sheriff's department to fill the void of the abolishment of the county sheriff's department, such as the City of Shelton which has established the Shelton Sheriff's Department to carry out warrants in the city. The geographic area of the county is served by the three separate judicial districts: Danbury, Stamford-Norwalk, and Fairfield. Each judicial district has a superior court located, respectively, in Danbury, Stamford, and Bridgeport. Each judicial district has one or more geographical area courts ("GA"'s), subdivisions of the judicial districts that handle lesser cases such as criminal misdemeanors, small claims, traffic violations, and other civil actions. Fire protection in the county is provided by the towns. Several towns also have fire districts that provide services to a section of the town. Education in the county is usually provided by the town governments. The exceptions are the towns of Redding and Easton, which joined together to form a regional school district (Region 9). According to the 2000 census, the county has a total area of 836.96 square miles (2,167.7 km2), of which 625.80 square miles (1,620.8 km2) (or 74.77%) is land and 211.15 square miles (546.9 km2). The terrain of the county trends from flat near the coast to hilly and higher near its northern extremity. The highest elevation is 1,290 feet (393 m) above sea level along the New York state line south of Branch Hill in the Town of Sherman; the lowest point is sea level itself. The Taconic Mountains and the Berkshire Mountains ranges of the Appalachian Mountains run through Fairfield County. The Taconics begin roughly in Ridgefield and the Berkshires begin roughly in Northern Trumbull, both running north to Litchfield County and beyond. A portion of the Taconics also is in rural Greenwich and rural North Stamford in Fairfield County and run north into Westchester County, New York, eventually re-entering Fairfield County in Ridgefield. Also a small portion of the Appalachian Trail runs through the county. The Appalachian Trail enters Connecticut in the northernmost and least populous town in the county, Sherman, and moves east into Litchfield County which encompasses the majority of the Appalachian Trail in Connecticut. The section of the Taconic Mountains range that runs through Greenwich and North Stamford of Fairfield County is also the part of the Appalachians that is closest to the coast out of the entire Appalachian Mountains. The agreed 1684 territorial limits of the county are defined as 20 miles (32 km) east of New York's Hudson River, which extends into Long Island Sound with a southernly limit of half way to Long Island, New York. The eastern limit is defined as the half way point of the Housatonic River with New Haven County with the exception of several islands belonging wholly to Stratford. The depth of the Sound varies between 60 to 120 feet (37 m). The county is home to the Byram River, Housatonic River, Mianus River, Mill River (Fairfield), Norwalk River, Pequonnock River, Rippowam River, and the Saugatuck River. Refer to List of Mountains and Summits in Fairfield County, Connecticut. Fairfield County was the home of many small, unconnected Native American tribes prior to the coming of the Europeans. From east to west the Wappinger sachemships included the Paugussetts, Tankiteke, and the Siwanoy. There were also Paquioque and Potatuck inhabitants of Fairfield County. The Dutch explorer Adriaen Block explored coastal Connecticut in the Spring and early Summer of 1614 in the North American built vessel Onrust. The first European settlers of the county, however, were Puritans and Congregationalists from England. Roger Ludlow (1590–1664), one of the founders of the Colony of Connecticut, helped to purchase and charter the towns of Fairfield (1639) and Norwalk (purchased 1640, chartered as a town in 1651). Ludlow is credited as having chosen the name Fairfield. The town of Stratford was settled in 1639 as well by Adam Blakeman (1596–1665). William Beardsley (1605–1661) was also one of the first settlers of Stratford in 1639. The original Fairfield County consisted of the towns of Rye, Greenwich, Stamford, Norwalk, Fairfield, and Stratford. In 1673, the town of Woodbury was incorporated and added to Fairfield County. In 1683, New York and Connecticut reached a final agreement regarding their common border. This resulted in the cession of the town of Rye to New York. From the late 17th to early 18th centuries, several new towns were incorporated in western Connecticut and added to Fairfield County, namely Danbury (1687), Ridgefield (1709), Newtown (1711), and New Fairfield (1740). In 1751, Litchfield County was constituted, taking over the town of Woodbury. The final boundary adjustment to Fairfield County occurred in 1788 when the town of Brookfield was incorporated from parts of Newtown, Danbury, and New Milford, with Fairfield County gaining territory from Litchfield County. Joseph Hawley (born 1603 in England; died 1690), who had emigrated to America in 1629 and then settled in Stratford in 1650, later becoming Stratford's first town clerk. Joseph Hawley's son Ephraim built the Ephraim Hawley House in 1683 in Trumbull that is still standing and serves as a private residence. Thomas Fitch (c. 1700–1774), from Norwalk, was a governor of the Colony of Connecticut. Gold Selleck Silliman (1732–1790) of the town of Fairfield fought for the Americans during the American Revolutionary War and rose to the rank of Brigadier General by 1776. He fought in the New York campaign that year. During the Revolutionary War, Connecticut's prodigious agricultural output led to it being known informally as "the Provisions State". In the spring of 1777, the British Commander-in-Chief, North America General William Howe, in New York City, ordered William Tryon to interrupt the flow of supplies from Connecticut that were reaching the Continental Army. Tryon and Henry Duncan led a fleet of 26 ships carrying 2,000 men to Westport's Compo Beach to raid Continental Army supply depots in Danbury on April 22, 1777. American Major General David Wooster (1710–1777), who was born in Stratford, was in charge of the stores at Danbury and defended them with a force of only 700 troops. Sybil Ludington helped rally New York militia to aid in the defense of Danbury. The New York militia included Sybil's father Colonel Henry Ludington. Though they arrived too late to save Danbury from burning, the elder Ludington and the New York militia helped support the Danbury troops and ensuing engagement of the British known as the Battle of Ridgefield on April 27, 1777. Wooster was wounded at Ridgefield and died five days later in Danbury. Two years later during a British raid on Greenwich on February 26, 1779 General Israel Putnam, who had stayed at Knapp's Tavern the previous night, rode away on his horse to warn the people of Stamford. Putnam was shot at by the British raiders but was able to escape. The hat he was wearing with a musket ball hole in it is on display at Knapp's Tavern in Greenwich (which is commonly, albeit somewhat erroneously, called Putnam's cottage). In the summer of 1779, General William Tryon sought to punish Americans by attacking civilian targets in coastal Connecticut with a force of about 2,600 British troops. New Haven was raided on July 5, Fairfield was raided on the 7th and burned. Norwalk was raided on July 10 and burned on the 11th. Norwalk militia leader Captain Stephen Betts put up resistance to the invaders, but was overwhelmed by the powerful British raiders and was forced to retreat. David Sherman Boardman (1786–1864) was a prominent early lawyer and judge in this and neighboring Litchfield County. On October 7, 1801, Neremiah Dodge and other members of the Danbury Baptist Association wrote a letter to then president Thomas Jefferson expressing their concern that as Baptists they may not be able to express full religious liberty in the state of Connecticut whose "ancient charter" was adopted before the establishment of a Baptist church in the state. Jefferson replied in a letter to Dodge and the other members of the Danbury church on January 1, 1802 in which he thought that there was "a wall of separation between church and State" that protected them. This well-known phrase occurs in Jefferson's letter to the Danbury church members and not in the First Amendment to the United States Constitution, nor in later amendments. Although it is often viewed as an extension of metro-New York City, Fairfield County has had much industry in its own right. Bridgeport Machines, Inc., a milling machine manufacturer, was founded in Bridgeport in 1938. Stamford, Connecticut is an example of edge city urbanization, with many large and important companies having offices there and benefitting from proximity to New York. At the height of its influence in the 1920s, the Ku Klux Klan had a distinct presence in the county and county politics. The group was most active in Darien. The Klan has since disappeared from the county. Fairfield County, along with all other Connecticut counties, was abolished as a governmental agency in accord with state legislation that took effect October 1, 1960. In the late 1960s and early 1970s corporations began moving their headquarters to Fairfield County from Manhattan; Thomas J. Lueck of The New York Times said that the trend "permanently decentralized big business in the New York region." During the 1980s many buyouts and reorganizations and an economic recession lead to companies vacating much of the suburban office space in Fairfield County. In 1992 Fairfield County had the headquarters of over 25 major multinational corporations, giving it the third largest concentration of those companies in the United States after New York City and Chicago. Recently, Fairfield County has been described as a "hedge fund ghetto" due to the large concentration of investment management firms in the area, most notably Bridgewater Associates (one of the world's largest hedge fund companies), Aladdin Capital Management and SAC Capital Advisors. Three minor league teams call Fairfield County their home: The Danbury Whalers (Federal Hockey League) the Class A affiliate of the Elmira Jackals, the Bridgeport Bluefish in baseball's independent Atlantic League and the Bridgeport Sound Tigers who are the New York Islanders American Hockey League affiliate. As far as professional sports, many in Fairfield County are fans of the New York teams (New York Yankees, New York Mets, New York Giants, New York Islanders, Brooklyn Nets, New York Rangers, New York Knicks, New York Jets, New York Red Bulls), with the county's proximity to New York City. But some (particularly in the eastern and far northern parts of the county) favor the Boston area teams (Boston Red Sox, New England Patriots, Boston Bruins, Boston Celtics, New England Revolution) as they feel more a part of the New England region than having a kinship with New York. Note: Villages are named localities within towns, but have no separate corporate existence from the towns they are in. Fairfield County has the most registered Ghost towns of any Connecticut county, Pleasure Beach and Cuties Island. All communities in the county are in the area code 203/area code 475 overlay except for the town of Sherman which is in area code 860 and part of the geographical New Milford Telephone Exchange. With Interstate 95 and the Merritt Parkway increasingly clogged with traffic, state officials are looking toward mass transit to ease the county's major thoroughfares' traffic burden. New office buildings are being concentrated near railroad stations in Stamford, Bridgeport and other municipalities in the county to allow for more rail commuting. Proximity to Stamford's Metro-North train station was cited by the Royal Bank of Scotland as a key reason for locating its new U.S. headquarters building in downtown Stamford; construction on the office tower started in late 2006. Within Fairfield County there are two regional airports: Igor I. Sikorsky Memorial Airport in Stratford and the Danbury Municipal Airport in Danbury. The county is also served by larger airports such as Bradley International Airport, John F. Kennedy International Airport, LaGuardia Airport, Newark Liberty International Airport, Tweed New Haven Regional Airport, and Westchester County Airport. Connecticut Transit's Stamford division runs local and inter-city buses to the southern part of the county. The Norwalk Transit District serves the Norwalk area in the southern central portion of the county; the Greater Bridgeport Transit Authority serves Bridgeport and eastern Fairfield County; and the Housatonic Area Regional Transit agency serves Danbury and the northern portions of the county. The Bridgeport & Port Jefferson Ferry carries passengers and cars from Bridgeport to Port Jefferson, New York across Long Island Sound. Ferry lines in and out of Stamford are also in development. Commuter Rail is perhaps Fairfield County's most important transportation artery, as it allows its residents an efficient ride to Grand Central Terminal in New York City. Service is provided on Metro-North's New Haven Line, and every town on the shoreline has at least one station. Connecting lines bring service to New Canaan from Stamford on the New Canaan Branch, and to Danbury from South Norwalk on the Danbury Branch. Many trains run express from New York to Stamford, making it an easy 45-minute ride. In the 2005 and 2006 sessions of the Legislature, massive appropriations were made to buy replacements for the 343 rail cars for the Metro-North New Haven Line and branch lines. The approximately 30 year old cars will be replaced with new cars at a rate of ten per month starting in 2010. Bridgeport and Stamford are also served by Amtrak, and both cities see a significant number of boardings on the "Regional Northeast Route" (Boston to Newport News, VA). This route also serves other Amtrak stations in Connecticut, including New Haven, New London, and Mystic. U.S. 1 is the oldest east-west route in the county, running through all of its shoreline cities and towns. Known by various names along its length, most commonly "Boston Post Road" or simply "Post Road", it gradually gains latitude from west to east. Thus U.S. 1 west is officially designated "South" and east is "North". Though contiguous, U.S.1 changes name by locality. In Greenwich it is Putnam Avenue. In Stamford it becomes Main Street or Tresser Boulevard. In Darien it is Boston Post Road or "the Post Road". In Norwalk it is Connecticut Avenue in the west and Westport Avenue in the east. In Westport, it is Post Road West from the Norwalk town line until the Saugatuck River and then it becomes Post Road East until Fairfield. In Fairfield it is again Boston Post Road or "the Post Road". In Bridgeport it follows Kings Highway in the west, North Avenue in the center, and Boston Avenue in the east. Finally, it becomes Barnum Avenue in Stratford. The western portions of Interstate 95 in Connecticut are known as the Connecticut Turnpike or the Governor John Davis Lodge Turnpike in Fairfield County and it crosses the state approximately parallel to U.S. Route 1. The road is most commonly referred to as "I-95". The highway is six lanes (sometimes eight lanes) throughout the county. It was completed in 1958 and is often clogged with traffic particularly during morning and evening rush hours. With the cost of land so high along the Gold Coast, state lawmakers say they don't consider widening the highway to be fiscally feasible, although occasional stretches between entrances and nearby exits are now sometimes connected with a fourth "operational improvement" lane (for instance, westbound between the Exit 10 interchange in Darien and Exit 8 in Stamford). Expect similar added lanes in Darien and elsewhere in the Fairfield County portion of the highway in the future, lawmakers and state Department of Transportation officials say. The Merritt Parkway, also known as "The Merritt" or Connecticut Route 15, is a truck-free scenic parkway that runs through the county parallel and generally several miles north of Interstate 95. It begins at the New York state line where it is the Hutchinson River Parkway and terminates on the Igor I. Sikorsky Memorial Bridge where it becomes the Wilbur Cross Parkway at the New Haven county line. The interchange between the Merritt Parkway and Route 7 in Norwalk was completed around the year 2000. The project was held up in a lawsuit won by preservationists concerned about the historic Merritt Parkway bridges. It is now exit 39 off the Merritt, and exit 15 off I-95. The parkway is a National Scenic Byway and is listed on the National Register of Historic Places. Interstate 84, which runs through Danbury, is scheduled to be widened to a six-lane highway at all points between Danbury and Waterbury. State officials say they hope the widening will not only benefit drivers regularly on the route but also entice some cars from the more crowded Interstate 95, which is roughly parallel to it. Heavier trucks are unlikely to use Interstate 84 more often, however, because the route is much hillier than I-95 according to a state Department of Transportation official. With its southern terminus at Interstate 95 in central Norwalk, U.S. Route 7 heads north through Wilton, Ridgefield, and Danbury to points north. In Danbury and almost all of Norwalk, the route is a highway (known as "Super 7" in the Danbury area or "The Connector" in Norwalk) but it becomes a four-lane road just south of the Wilton-Norwalk border and up to Danbury. There is significant opposition to making the route a limited access highway for the entire length by residents of Wilton and Ridgefield. As a compromise between freeway supporters and opponents, the Connecticut Department of Transportation is upgrading the existing 2-lane section to 4 lanes, with a median in some locations. The state is also bypassing the existing 2-lane Route 7 around Brookfield with a freeway, where town officials have long supported an expressway to divert traffic away from the town center. Route 8 terminates in downtown Bridgeport from I-95 with Connecticut Route 25 and goes north. It splits from Connecticut Route 25 at the Bridgeport—Trumbull town line and continues north into southeastern Trumbull and Shelton, then beyond the county through some of towns of the Naugatuck River Valley to Waterbury and beyond. Construction of the route provided some impetus for the creation of office parks in Shelton and home construction there and in other parts of The Valley. Route 25 Starts in downtown Bridgeport from I 95 with Route 8 and goes north. It splits from Connecticut Route 8 at the Bridgeport—Trumbull town line and continues into Trumbull. The limited access divided expressway ends in northern Trumbull, but Route 25 continues into Monroe, Newtown, and Brookfield. As of the census of 2000, there were 882,567 people, 324,232 households, and 228,259 families residing in the county. The population density was 1,410 people per square mile (545/km²). There were 339,466 housing units at an average density of 542 per square mile (209/km²). The racial makeup of the county was 79.31% White, 10.01% Black or African American, 0.20% Native American, 3.25% Asian, 0.04% Pacific Islander, 4.70% from other races, and 2.49% from two or more races. 11.88% of the population were Hispanic or Latino of any race. 17.6% were of Italian, 12.4% Irish, 6.5% German and 6.4% English ancestry according to Census 2000. 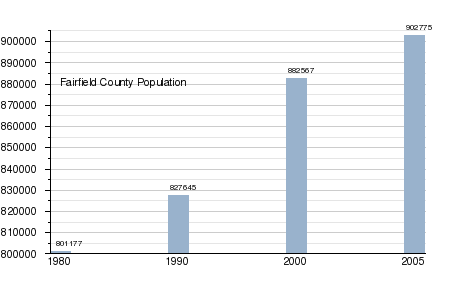 In 2010, 66.2% of Fairfield County's population was non-Hispanic whites and 10.8% of the population was black. Asians were 4.6% of the population. Latinos now constituted 16.9% of the population. As of 2000, 76.2% spoke English, 11.0% Spanish, 2.0% Portuguese, 1.7% Italian and 1.1% French as their first language. Some of the last group were Haitians, although other Haitians would identify Haitian creole as their first language. There were 324,232 households out of which 34.20% had children under the age of 18 living with them, 55.50% were married couples living together, 11.50% had a female householder with no husband present, and 29.60% were non-families. 24.00% of all households were made up of individuals and 9.40% had someone living alone who was 65 years of age or older. The average household size was 2.67 and the average family size was 3.18. In the county the population was spread out with 25.60% under the age of 18, 7.00% from 18 to 24, 30.90% from 25 to 44, 23.30% from 45 to 64, and 13.30% who were 65 years of age or older. The median age was 37 years. For every 100 females there were 93.40 males. For every 100 females age 18 and over, there were 89.60 males. The median income for a household in the county was $65,249, and the median income for a family was $77,690. Males had a median income of $51,996 versus $37,108 for females. The per capita income for the county was $38,350. About 5.00% of families and 6.90% of the population were below the poverty line, including 8.30% of those under age 18 and 6.60% of those age 65 or over. In 2000, the largest denominational groups were Catholics (with 433,832 members) and Mainline Protestants (95,244). The largest religious bodies were The Catholic Church (433,832) and Judaism (38,800 ). Data is from the 2010 United States Census and the 2006-2010 American Community Survey 5-Year Estimates. Data is from the 2007-2011 American Community Survey 5-Year Estimates, ACS Demographic and Housing Estimates, "Race alone or in combination with one or more other races." ^ See "BEA : CA1-3 - Per capita personal income". http://www.bea.gov/regional/reis/drill.cfm?table=CA1-3&catable=CA1-3&lc=30&years=2005&rformat=display&areatype=LOCAL&sort=1. Retrieved 2008-09-23. ^ Richard Somerset-Ward (11 June 2005). An American theatre: the story of Westport Country Playhouse, 1931-2005. Yale University Press. p. 24. ISBN 978-0-300-10648-0. http://books.google.com/books?id=7wbvVZvDjrYC&pg=PA24. Retrieved 21 November 2011. ^ "CCR: Volume 02, Page 39". http://www.colonialct.uconn.edu/ViewPageBySequentialID.cfm?v=02&p=39&c=4&StartVolume=1&StartPage=1. Retrieved 2008-06-17. ^ "SOTS: Sites, Seals & Symbols". State of Connecticut Secretary of the State. http://www.sots.ct.gov/sots/cwp/view.asp?A=3188&QUESTION_ID=392608. Retrieved 2008-06-12. 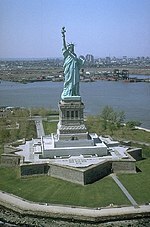 ^ "Greenwich Connecticut History". Archived from the original on 2008-06-28. http://web.archive.org/web/20080628054601/http://www.rootsweb.ancestry.com/~ctfairfi/pages/greenwich/greenwich_hstry.htm. Retrieved 2008-06-15. ^ "SOTS: Section VI - Counties - Table of Contents". State of Connecticut, Secretary of the State. http://www.ct.gov/sots/cwp/view.asp?a=3188&q=392376. Retrieved 2008-06-16. ^ Lueck, Thomas J. "Vacated Corporate Headquarters Scatter the Suburban Landscape." The New York Times. December 7, 1992. A1, New York Edition. Retrieved on January 5, 2009. ^ "CTTransit - Connecting the Community". http://www.cttransit.com/. Retrieved 2008-06-10. ^ "National Register of Historical Places - CONNECTICUT (CT), Fairfield County". National Park Service and United States Department of the Interior. http://www.nationalregisterofhistoricplaces.com/CT/Fairfield/districts.html. Retrieved 2008-06-24. ^ "NACo Find a County". Archived from the original on 2008-03-14. http://web.archive.org/web/20080314153211/http://www.naco.org/Template.cfm?Section=Find_a_County&Template=/cffiles/counties/county.cfm&id=9001. Retrieved 2008-06-23. ^ a b "County Membership Reports". thearda.com. http://www.thearda.com/mapsReports/reports/counties/09001_2000.asp. Retrieved 2011-08-22. ^ "SELECTED ECONOMIC CHARACTERISTICS 2006-2010 American Community Survey 5-Year Estimates". U.S. Census Bureau. http://factfinder2.census.gov/faces/tableservices/jsf/pages/productview.xhtml?pid=ACS_10_5YR_DP03&prodType=table. Retrieved 2012-11-25. ^ "Profile of General Population and Housing Characteristics: 2010 Demographic Profile Data". U.S. Census Bureau. http://factfinder2.census.gov/faces/tableservices/jsf/pages/productview.xhtml?pid=DEC_10_DP_DPDP1&prodType=table. Retrieved 2012-11-25. ^ "ACS DEMOGRAPHIC AND HOUSING ESTIMATES 2007-2011 American Community Survey 5-Year Estimates". U.S. Census Bureau. http://factfinder2.census.gov/faces/tableservices/jsf/pages/productview.xhtml?pid=ACS_11_5YR_DP05&prodType=table. Retrieved 2013-01-08. The Advocate of Stamford - Stamford edition, published by Southern Connecticut Newspapers Inc., a subsidiary of the Tribune Company. Connecticut Post, owned by Media General Group, published in Bridgeport. Greenwich Time, published by Southern Connecticut Newspapers Inc., a subsidiary of the Tribune Company. The Hour (registration required), controlled by a trust under the ultimate authority of Norwalk Probate Court. The News-Times of Danbury, owned by Ottaway Newspapers, a subsidiary of Dow Jones. The Fairfield County Business Journal, published by Westfair Communications Inc. The Newtown Bee published in the heart of Newtown. The Hartford Courant (occasionally covers Fairfield County; owned by the Tribune Company). New York Daily News (occasionally covers Fairfield County). New York Times (occasionally covers Fairfield County). El Sol News, countywide, based in Stamford. El Canillita, distributed across southwestern Connecticut. Pluma Libre, distributed across southwestern Connecticut. News 12 Connecticut has studios in Norwalk and covers Fairfield County as well as state wide news from Hartford http://www.news12.com/CT. Greater Bridgeport Symphony. Founded in 1945, its concerts are held at Klein Memorial Auditorium in Bridgeport. The orchestra offers a free outdoors pops concert in the summer at Fairfield University. Gustav Meier has been with the GBSO for 41 years. Connecticut Grand Opera, a not-for-profit, professional opera company founded in 1993 and based in Stamford, where it performs at the Palace Theatre. On its web site, the CGO claims to offer "the most ambitious opera season of any company between New York and Boston." Danbury Symphony Orchestra. This orchestra does not have its own Web site and only part of a web page at the Danbury Music Center web site is devoted to it. Greenwich Symphony Orchestra. Begun in 1958 as the Greenwich Philharmonia, the orchestra has grown to 90 members who perform at the Dickerman Hollister Auditorium at Greenwich High School. It also performs a pops concert in the summer. David Gilbert has been music director and conductor since 1975. Norwalk Symphony Orchestra. Its concerts take place in a graceful, large "Norwalk Concert Hall" auditorium of Norwalk City Hall. Founded in 1939, the NSO remained primarily a community orchestra of volunteers. In 1956, the Norwalk Youth Symphony was created, and younger musicians often were invited to be part of the orchestra. Diane Wittry has been music director and conductor since 2002. For the past eight years she has held the same title at the Allentown Symphony Orchestra in Pennsylvania. Ridgefield Symphony Orchestra Annually, the RSO presents four subscription concerts at the Anne S. Richardson Auditorium at Ridgefield High School, and two chamber music concerts at the Ridgefield Playhouse for the Performing Arts (only one is scheduled in the 2006-07 season), along with an annual "family concert" and performances in Ridgefield schools. Stamford Symphony Orchestra The SSO typically gives five pairs of classical concerts and three pops concerts a season at the 1,586-seat Palace Theatre. It also performs a concet for elementary school students and a family concert series. Western Connecticut Youth Orchestra, a not-for-profit organization providing talented young musicians in the Fairfield County and Upper Westchester County areas with a classical symphony experience. The Barnum Festival has been held in the Spring in Bridgeport since 1949 to raise money for charity. The Connecticut Film Festival is held in the Spring in Danbury. The Fairfield County Freestyle Championships are generally held once a semester on the campus of Sacred Heart University. This event showcases the best freestyle dancers and rappers that live, work, or go to school in Fairfield County. The event is sponsored by the SHU Freestyle Club. The Gathering of the Vibes musical event has been held in Bridgeport's Seaside Park in 1999, 2000, 2007, and again in 2008. The Norwalk Oyster Festival is an annual fair in the city of Norwalk that features craft vendors and live music performances. The festival takes place on the first weekend after Labor Day in Veterans Park, near Long Island Sound. Coastal Fairfield County Convention and Visitors Bureau serves Stamford, Norwalk, Bridgeport, and Shelton and the towns of Greenwich, Darien, New Canaan, Wilton, Westport, Weston, Fairfield, Easton, Monroe, Stratford, and Trumbull. Northwest Connecticut Convention and Visitors Bureau, serves Litchfield County and communities in northern Fairfield County. In Fairfield County it serves Ridgefield, Redding, Newtown, Bethel, Brookfield, Danbury, Sherman, and New Fairfield. This page uses content from the English language Wikipedia. The original content was at Fairfield County, Connecticut. The list of authors can be seen in the page history. As with this Familypedia wiki, the content of Wikipedia is available under the Creative Commons License.